In the 1970s Fresno State alumnus John W. Long decided to leave his estate to Fresno State. Mr. Long worked in retail, selling men’s clothes in Los Angeles. He had no wife or children, and believed that through an estate gift to Fresno State he could make a difference in the lives of students from all walks of life. Driven by his vision to support scholarships, Mr. Long spent the next 40 years steadily building his worth through investments and real estate. When Mr. Long died in January, the value of his estate had topped $5 million. Mr. Long did not notify Fresno State of his plans until 2012. It was determined his gift will establish endowments funding full-tuition scholarships for more than 20 Fresno State students every year in perpetuity. Mr. Long wanted no recognition for his gift. He asked to remain anonymous until after his death and to name the scholarships for his mother Miriam Long. “The impact of his gift to Fresno State is staggering. Thousands of lives will be changed, but he wanted no acknowledgement for his generosity,” said director of Planned Giving Steve Spriggs, the only representative from Fresno State with whom Mr. Long agreed to meet. 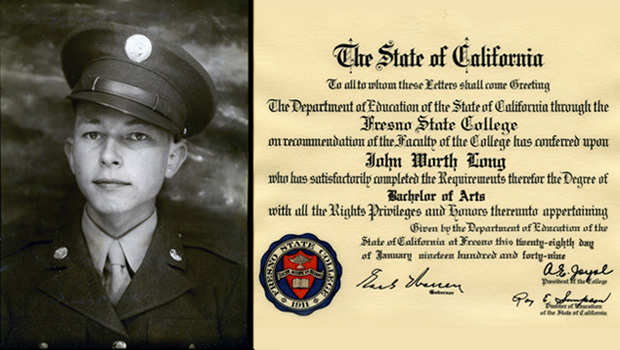 His connection to Fresno State goes back to his mother, who earned her teaching credential from the university in 1919 when it was Fresno State Normal School. She spent her career teaching elementary school in west Fresno and helped to support Mr. Long as he attended Fresno State to study commerce, which is now called business. World War II interrupted Mr. Long’s college experience. He enlisted in the Army and served on a medical ship, returning to campus after the war. He developed a passion for retail while working in the Fresno State bookstore. He worked in men’s retail throughout his career. He lived a private and simple life that according to Spriggs afforded him the money to invest in apartment complexes near the University of California, Los Angeles campus. Mr. Long passed away on Jan. 26 in Southern California. Spriggs expects his estate to be settled by the end of this year, establishing three scholarship endowments at Fresno State. The inaugural Miriam Long Scholars will be named for the 2014-15 academic year. For more information, contact Kathleen R. Schock, director of media and development communications, at 559.278.2756 or kschock@csufresno.edu.